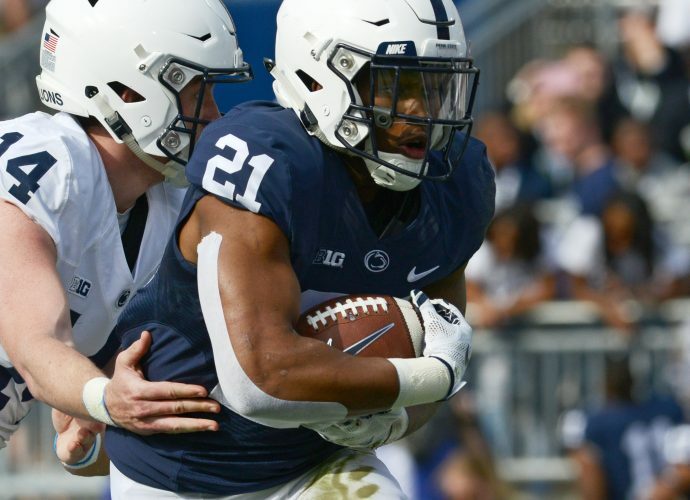 UNIVERSITY PARK (AP) – Penn State coach Patrick Chambers walked right past the Wisconsin locker room with a solemn look before answering questions in a methodical voice. The 22nd-ranked Badgers had just beaten his team 63-60 on a buzzer-beating 3-pointer by Traevon Jackson – a tough finish that had the normally bubbly Chambers feeling down for his players. Jermaine Marshall scored 23 points for Penn State (10-20, 2-16 Big Ten) and D.J. Newbill added 22, including a jumper from the elbow with 5 seconds left to tie the game at 60. But Jackson made a contested 3 at the buzzer to finish with 15 points and Wisconsin survived an upset scare in the regular-season finale for both teams. The Badgers (21-10, 12-6) went the length of the court with less than 4 seconds left. Jackson pulled up on the wing and made his 3 over the outstretched arm of Kevin Montminy. Officials upheld the basket after a replay review, and anxious fans at the Jordan Center let out a collective sigh of disappointment. Wisconsin nearly threw the ball away on the inbounds play but managed to hold on in the scrape on the floor as the officials called a tie-up. Jackson’s clutch shot then had the Badgers pumping their arms in victory. “It felt good. When the shot comes off your hand like that … I just kind of knew it was going to go in,” Jackson said. They might be last in the Big Ten, but the Nittany Lions challenged Wisconsin. They are 2-2 since starting 0-14 in conference, and the tough play extended into the regular-season finale at an energized Jordan Center. After the Badgers started 5 of 6 from the field, Penn State tightened up defensively to hold Wisconsin to 5 for 21 the rest of the first half. The Nittany Lions’ backcourt duo of Marshall and Newbill each scored 10 points for a 25-24 halftime lead, and the game settled into a see-saw affair the rest of the way. Foul trouble hurt Penn State in the closing minutes, though. The Nittany Lions had trouble scoring with Marshall on the bench with four fouls until he re-entered with about three minutes left and scored Penn State’s next four points to stay within one possession of the lead. Wisconsin stopped a two-game losing streak that dropped the Badgers out of the Big Ten title race. Poor second-half play doomed them in defeats to Purdue and Michigan State. This time, Jackson and the Badgers held on down the stretch, though there were plenty of harrowing moments. The Badgers turned the ball over on an inbounds under their own basket with less than 25 seconds left, giving the Nittany Lions another chance to tie. Newbill missed a long jumper, but Nick Colella corralled the rebound and found Newbill again. The sophomore guard did a stutter-step before pulling up at the elbow for the tying bucket. Mike Bruesewitz then almost threw the ball away again from the exact same spot before the Badgers scrambled to hold on for possession and Jackson’s game-winner. Sam Dekker finished with 14 points for Wisconsin, while Jared Berggren had 12 points and 10 rebounds. Wisconsin got another break later Sunday when Michigan lost to Indiana. The Wolverines and Badgers ended up in a fourth-place tie in the Big Ten – but Wisconsin got the fourth seed and the last first-round bye in the league tourney based on its win over Michigan this season. The Wolverines are the fifth seed and must play in the first round Thursday afternoon against Penn State, which was locked into the last seed. But the Nittany Lions will have some confidence after an 84-78 upset of then-No. 4 Michigan on Feb. 27.